Automatic subscription building helps managing subscriptions if your business requires to deal with a large or variable (increasing) number of subscriptions. 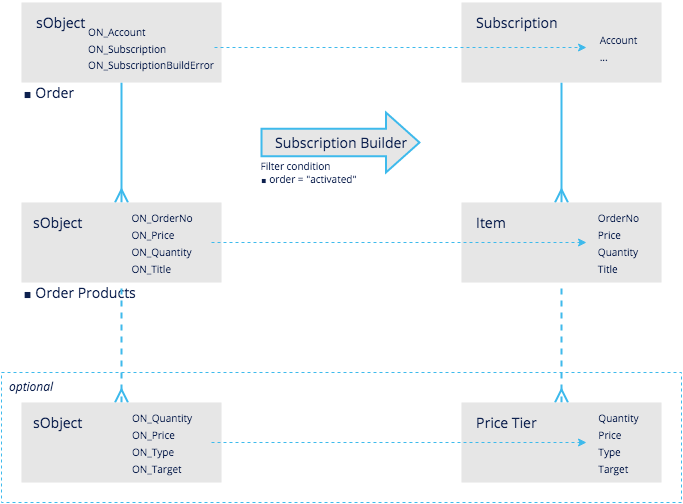 The way to set up the subscription builder depends on the nature of your products and the representation of your source data in Salesforce. Remember that subscriptions and their items are in a parent-child relationship. So if your source data is stored in a parent-child relationship, like opportunities and opportunity products, for example, you can set up these objects to produce the subscriptions based on the parent object and the subscription items out of its child objects. Since these objects (opportunities, orders, etc.) usually are account-specific, you can, this way, bill an account-specific set of products under some account-specific conditions. Now assume that you bill identical products on equal conditions to multiple accounts. In this case, your source data may reside on a single object - there is just the account or a contract that holds all information. In this context, JustOn recommends to make use of master subscriptions - subscription "models" that already include the items and that are copied for each target object. Finally, there may be data in addition to the configured fields for master subscriptions or objects in a parent-child relationship, or from customized source objects whose records hold all information. If you need to create or update subscriptions based on this data, which is not accessible otherwise, you set up specific data mappings to retrieve it. You can combine multiple sources, providing the corresponding setup. You must configure the subscription builder depending on the nature of your business and your source data. If necessary, you can combine multiple sources, providing the corresponding setup. 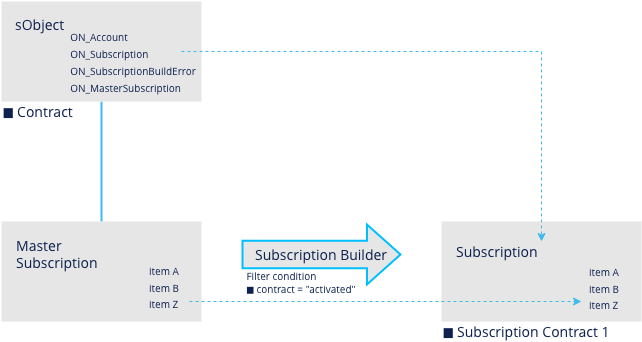 For the purpose of this documentation, we assume the minimum required steps to illustrate the subscription builder setup. For a complete overview of the subscription builder setup options, see here. To allow for individually configured items when building subscriptions, you can use objects that are in a parent-child relationship, like opportunities with opportunity products. If set up accordingly, the subscription builder takes the parent object ( opportunity) to produce the subscription, and the child objects ( opportunity products) to produce the subscription items. The subscription builder requires a number of ON fields on the parent object. b) the account currency differs from the source object currency. The subscription builder requires a number of ON fields on the child object. ON_Price Formula (Currency) The net sales price of the item, required if the detail object is defined in a subscription build filter. ON_Quantity Formula (Number) The quantity of the item to be invoiced, required if the detail object is defined in a subscription build filter. ON_Title Formula (Text) The name or title of the item required if the detail object is defined in a subscription build filter. Depending on your use case and its requirements, you can add more fields to have them copied to the generated subscription items. For details, see ON Fields on Objects. A master subscriptions is a subscription "model" that is copied for each target. The target is the object whose records are the basis for subscriptions, like accounts, contracts, cases, quotes, etc. If set up accordingly, the subscription builder can generate an individual subscription for each new account, contract, case, quote, etc. that you create. This generates the new item. Repeat this step for every item to be cloned. The subscription builder requires a number of ON fields on the target object. from customized source objects whose records hold all (variable) information for creating subscriptions and items. The subscription builder requires a number of ON fields on the source object. This makes the mapping definition available for the object configuration and thus for the subscription builder. Irrespective of the configured data source for the subscription build, you must create a subscription build filter. Completing these steps allows you to manually trigger the subscription build process from the detail page of the configured target object (account, contract, case, quote, etc.) by clicking the New Subscription button. Add the New Subscription button to the page layout. Some business use cases may require to invoke the subscription builder remotely from external systems. To this end, you can call the subscription builder using a REST web service. The web service accepts one ore more records and creates subscriptions in the same way as the local batch job. Replace INSTANCE with the actual Salesforce instance or custom domain where JustOn is installed and running. For details, see Step Two: Set Up Authorization in the Force.com REST API Developer's Guide. The web service accepts HTTP POST requests. The body of the request must contain a valid JSON data structure. Basically, the JSON structure represents a deserialized sObject and lists a number of records. The keys are mapped to field names of the subscription or the item. The JSON code can also include child records. The key ON_Account__c is mandatory at the parent record. It can refer to a Salesforce ID or an external ID. When referring to an external ID, you must also refer to an existing mapping that holds the externalIdFields variable for Account__c (see externalIdFields). The keys ON_MasterSubscription__c, ON_MappingName__c and ON_UseCase__c on the parent record are used in the same way as for accordingly configured objects (see ON Fields on Objects). Keys that start with ON_ are directly mapped to subscription or item fields. Fields without the ON_ prefix can only be referenced and used by a corresponding mapping (see Using Data Mapping). The response always returns the HTTP status code 200 once the body of the request can be successfully parsed. Otherwise, the system will return an HTTP status code 500 with the error in the body of the response. For details about possible HTTP status codes, see RestResponse Class in the Apex Developer Guide. If the subscription build fails before the database insert (like, for example, with a missing account, a missing mapping, or a missing master subscription), it is marked as failed. Other subscriptions passed with the same request may still succeed, however. "buildError":"Batch persisting of Subscriptions failed." "buildError":"Item upsert: Name=SUBSCRIPTION_FEE : REQUIRED_FIELD_MISSING: Required fields are missing: [ONB2__Title__c]; fields  [ONB2__Title__c]"